Ripples: Tapping the screen causes a splash that startles the fish beneath. Why is The Blimp Pilots' creation so popular? Perhaps it’s because there’s too much stress in our lives, and Koi Pond does its best to combat the headaches by combining the soothing sounds of nature with the peaceful tranquility of fish. 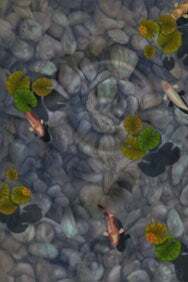 The app offers a realistic depiction of a pond with koi swimming around, casting shadows and changing course as real fish would. But it’s also interactive. Tapping the screen causes ripples in the water—complete with splash sound effects—that scatter fish and send lily pads shimmering (tap with headphones on and you’ll even hear the sound come out of the correct ear depending on where you tap). Tap the screen and leave your finger in place, and the fish will approach your finger as if it were a cloud of phytoplankton (the iPhone vibrates when the fish “nibble” on you). Season's Greetings: A special Holiday mode makes Koi Pond most festive for two months of the year. To that you can add soothing, accurate background sounds for birds, water, frogs, and bugs (layer as many as you want), plus the app offers you some control over the color scheme, brightness, and number of fish and lily pads. Shaking your iPhone even “feeds” the fish, depositing tasty morsels in the water that the koi eat (with an accompanying splash). The latest version also adds a Holiday mode that’s available during November and December (of this year and future years as well). 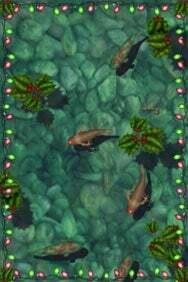 Activating it—via a button in the upper-left corner of the screen—adds holiday lights around the edges, seasonal koi, holly leaves instead of lily pads, and a sleigh bell sound effect that accompanies the shaking (feeding) motion. Many iPhone users have already given Koi Pond a try. If you’re not one of them, and if you’re looking for a distraction from the day, your $1 spent on Koi Pond won’t be wasted. It's relaxing, somewhat addictive, and most of all, beautifully designed. Koi Pond is compatible with any iPhone or iPod touch running the iPhone 2.x software update.